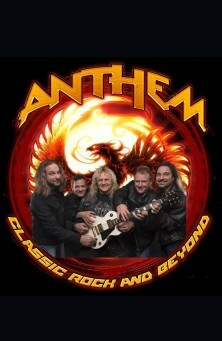 Anthem, Classic Rock with an Edge is an experience you just have to see and hear! This line up of experienced artists have performed at major venues and festivals throughout the Midwest for the past two decades Anthem's song list extends from their trademark proven classic rock favorites all the way up to todays popular selections. The musical chorus will stay with you long after the show is over, making you want to come back and hear all your favorite songs again and again. Matt Medlen of Chicagoland Concert & Event Review says "These guys bring years of experience to the stage and it shows, various members take turns performing the lead on songs that fit their broad vocal ranges. Amazing that these guys packed so much music and talent into a single show. An Amazing performance and well worth the price of admission." Kevin Willison, Lead singer, says "this is your show, we are just hosting the party." If you are looking for a band that is not only entertaining but also willing to work with you to make your event special Anthem is the band to book.